Note: the current residents of this house have asked that I not use their real names in the following article. They have also asked that I not reveal the address of the house. It’s a lovely house – really it is. Built in 1910, the 12 room house occupies a spacious lot on Cherry Street. A crumbling carriage house (this isn’t a pretention – in its day, the building housed actual carriages) sits at the back of the property. Inside the house, the high ceilings and ornate woodwork suggest an elegance and solidness missing in modern houses. Like I said, it’s a lovely house; it’s also haunted – really it is. It was a warm fall day in early October when I first went to see Tina and her mom, Delores. I rang the doorbell and heard a mechanical ringing from deep within the house, which was immediately followed by the sound of barking dogs. (I soon learned that the doorbell, like other things in the house, dated to the construction of the house but still continues to work reliably.) Tina opened the door briskly, shooed her three dogs away and led me into the living room. After a few minutes of small talk, Delores joined us. Tina and Delores have lived in the house since 1991. Up to then, the house had only been in the hands of one other family, the Berrys, and perhaps it’s best to start with them. Berry family patriarch Arthur “A.J.” Berry as he appeared in the “Who’s Who in Marion” piece that ran in March of 1925 in The Marion Daily Star. Image courtesy of the Marion County Historical Society. Born in Marion in 1876, Arthur “A.J.” Berry spent his entire life living and working in Marion. After graduating from Marion High School, he worked as a reporter for The Marion Star (owned, at the time, by Warren G. Harding). Later, he managed the Marion County Telephone Company and, later still, served as vice president at the National City Bank and Trust Company. Perhaps it’s no accident that all of these companies had deep ties with Marion because Arthur Berry was also deeply civic-minded. 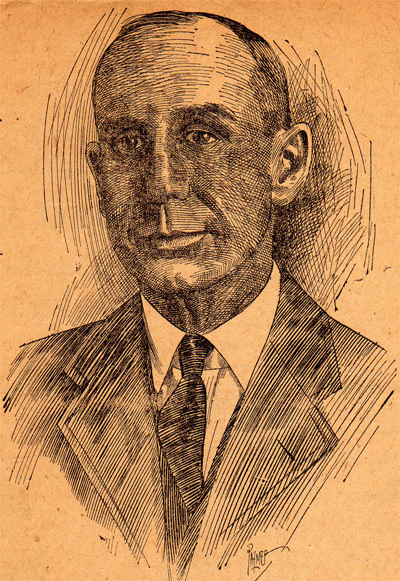 Among other things, he organized the Marion Chamber of Commerce in 1919 and served as secretary of the building committee during the construction of the Harding Hotel in 1924. In 1918, at the relatively late age of 42, Arthur married Alma Reading, a woman 20 years his junior, and they settled into Arthur’s grand house on Cherry Street. In 1921 Alma gave birth to their only child, a daughter they named Joan. Whereas Joan’s father appears to have spent his entire life happily living in Marion, Joan, it seems, couldn’t wait to get out. An aspiring actress, she left town for Missouri to study at Stephens College, which, even today, is considered one of the best schools for theater in the country. She later came back to Ohio to study at The Play House, a theater in Cleveland. During World War II she served as a Red Cross volunteer in Jacksonville, Florida, and married a service man named Kennedy. They had two children together, a son and a daughter. The details of what Joan did in the years after the war are scarce, though the public record shows that she and Mr. Kennedy divorced and Joan married another man, a fellow by the name of van Atta, and they eventually had a son together. However, Joan and Mr. van Atta also divorced. By 1969 Joan was once again living in the Berry home on Cherry Street (Arthur Berry died in 1961) with her third husband, a man named Kayatin. They, too, eventually divorced. Jan van Atta, Joan’s son, inherited the Cherry Street house, and he eventually sold it to Tina’s parents in 1991. By the time Tina’s father, Russell, saw the house, it was already starting to decline. However, Russell could still see the possibility for grandeur that the house possessed and bought it with plans to fix it up into the family’s dream home. Unfortunately, Russell, who was a long-distance trucker, died in 1993 while on the road, thus leaving the house to Delores and Tina. In the twenty years they’ve lived there, their awareness that strange things are sometimes afoot in the house has been gradual, though both women have experienced enough weird activity to be convinced that the house is indeed haunted. As I sat with Tina and Delores that October afternoon, they recounted some of the strange incidents that had happened in the house over the years. Some of the incidents Tina and Delores described are odd but essentially harmless: Pictures routinely fall from the walls. Once a whole series of photos fell off in the order in which they were hung. 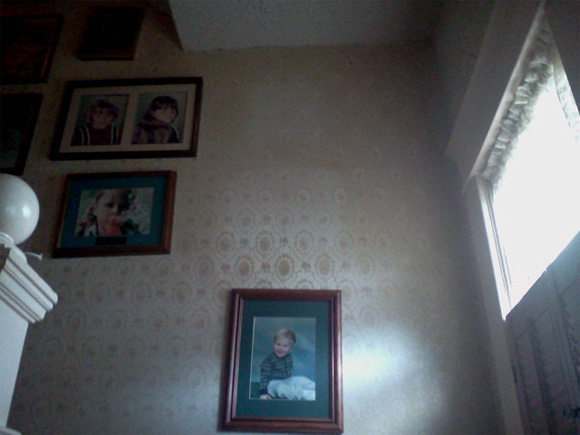 Another time the upper pictures fell off the wall while the lower ones remained hanging. Cupboards sometimes open by themselves. Occasionally, they hear enormous crashes only to find that nothing has fallen. A photo Tina took immediately after the top two pictures mysteriously fell from the wall. Note the undisturbed bottom picture. Other stories, however, are a little creepier: When her family moved into the house, Tina said there were scratches all over the walls from Joan’s Dobermans. These scratches were perhaps a sign of the role the dogs – both Tina’s and Joan’s – would play in the haunting. Tina said her dogs have been afraid to enter some parts of the house. The dogs’ toys have disappeared only to reappear after a good stretch of time. One of the strangest incidents happened during the summer of ’91. Tina, who was 14 at the time, said she was lying on her parents’ bed talking on the phone with her feet were dangling off of the edge of the bed. Suddenly, she felt something animal-like run by her legs, and this was accompanied by the sound of jangling chains. It was an experience that was still vivid in her memory when, months later, she and some friends were exploring some of the rooms in the house’s large basement and came across some chains hanging on the wall. They were choker chains that had belonged to Joan’s Dobermans. When one of Tina’s friends lifted a chain off of the wall, Tina immediately recognized the sound that she had heard while lying on her parents’ bed that night. 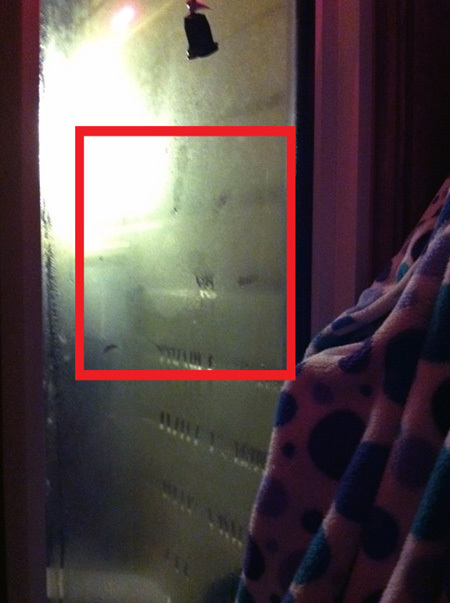 The hand print that appeared on the inside of the window one night. Tina also talked about the time she woke up one night to use the bathroom and, on her way back to bed, saw a very large hand print on a fogged-up window. Tina thought at first that perhaps someone outside had placed his or her hand on the outside of the window to make the print. However, the window was double-paned and, in any case, upon closer examination, she realized the hand print was on the inside of the window. She said she immediately “freaked out” and woke her sleeping mother up. Tina said that the thought did cross her mind that maybe her mom had done it to scare her. Delores, however, denied that it was hers, and Tina was quick to tell me that her mom has never intentionally scared her. In another incident, Delores related how she and her granddaughter once saw small footprints, side by side, on the floor of the bathroom. The prints, Delores assured me, were human-shaped and not from one of the dogs. In fact, the bathroom seems to be an ‘active’ part of the house. Tina said that both she and her niece have, while taking showers, seen shadows moving across the surface of the shower curtain as if someone is in the bathroom with them. However, every time they looked out from behind the curtain to see who was there, the bathroom was empty. Tina told me that one time, after one of these incidents had occurred, she was standing in the shower trying to calm down when there was a distinct smack on the shower curtain right near her face. Outside of Delores and Tina’s family, other people have also had unsettling experiences in the house. Tina said that one time her friend Heather was over and they were up late talking. There was a TV in the room, but it was turned off. Tina had her back to the TV, but Heather was facing it. Suddenly, Heather’s eyes welled up with tears for no discernible reason – Tina pointed out that Heather was not prone to crying – and she seemed to slip into a trance. When the spell was finally broken, Heather said that she had seen a man reflected in the dark TV screen. Tina said that she thought perhaps it was her deceased father, Russell. Scared and upset, the girls spent the night dozing together on the couch. Many other friends and relatives have also visited the home and, unprompted, said that they feel very uneasy there, as if someone is on their heels when they walk from room to room. Some family members even refuse to go to the second and third floors alone and at night. Although they believe other spirits dwell in their house, both Tina and Delores agree that Joan (and perhaps her dogs) are at the heart of the haunting. For her part, Delores said that she’s never felt threatened. In fact, whenever weird incidents are happening, she just says, “Now Joan, behave.” A paranormal investigation carried out by the now-defunct group Eerie Paranormal in 2011 concluded that the spirit (or spirits) have a certain affinity for Delores (though for reasons that remain unknown). Tina, on the other hand, feels more threatened, perhaps because she’s had more negative experiences in the house over the years. The thought of selling the place – a place that is probably too big and hard to take care of for just two people with compromised health – is often on their minds, and that’s part of the reason they have asked me not to reveal the exact address of the house. After all, trying to sell a house these days (let alone a haunted one) is hard enough. 1 While leaving, Tina pointed out the light switches installed on the baseboard next to the front door. It turns out that Joan had them installed so that if she came home too drunk to stand, she could simply turn on the lights from down there as she crawled over the threshold. 2 Joan often hid money in books but then forget which ones, exactly. As a result, she would sometimes pay kids in the neighborhood to come over and look through her books for the money. I live on corner of Cherry and Bellefontaine. People often tell me my house is haunted. As of October 15, 2013, I’ve lived here 1 year. There s another house on Cherry St. that is supposedly haunted. Not sure of the address, but a close friend lived there back in the 80’s and she told me that herself and her female roommate literally left that house in the middle of the night, leaving everything they owned there. I know it’s close to the Bellefontaine St. intersection. Want to hear something weird? “Delores” and I did move out last October. It felt GREAT to be free from that home! Immediately, we felt better and didn’t feel like we were being watched. However, my mom fell ill within 2 weeks of moving and was hospitalized for about 3 weeks, in and out of ICU. She was due to be released by the weekend but fell and passed from a brain injury on Thursday. I know it sounds dumb, but I blame that house on Cherry St. I refuse to go back in there, mostly because I know whatever is there isn’t good. After an investigation by a local paranormal group, they informed my mom that whatever is there is VERY attached to her. I would burn the place to the ground if I could. I’d hate for any other family to be afflicted the way ours was by that place. “Tina” did you once have a couple of kids, probably in 2006, come cut your hedges in the back yard? Only to not finish? If so, that was me and a friend and we got pretty sick after working there the first day. As a child I lived directly behind this house. My back yard butted up against the property. There was a tall fence because of the dogs who I remember as well. They were very mean! I used to lay in my yard and daydream about that house. Seems like it used to be painted an unusual color. I really don’t recall the owners. Coming across this story is such a gem! Although I am so for Tina’s loss. May she find some peace. I must have this book. We moved every school year all over Marion so I have played or lived by many of the places in this book. Fascinating! I know this house all too well. The one next to it was visited by the spirits back then. Me and my friend were sitting up one night, and we had the upstairs window opened. We were watching the stars, and my friend started crying and wanted to close the window. She told me that someone told her that if she didn’t quit looking at them, they were going to drag her out the window. I thought she had fallen asleep dreaming, but she was wide awake. She was scared to the point that she couldn’t forget it and wouldn’t open her curtains after that.